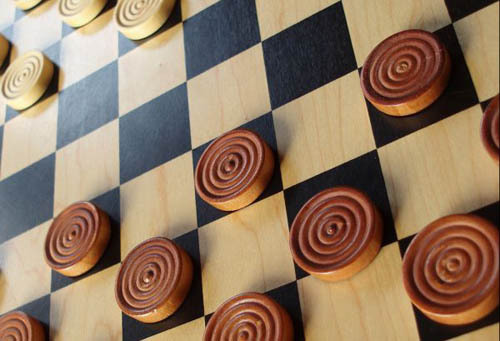 Draughts (or checkers) is played by two players, on opposite sides of a playing board, alternating moves. One player has dark pieces, and the other has light pieces. It is against the rules for one player to move the other player’s pieces. The player with the light pieces makes the first move unless stated otherwise. A move consists of a player moving their piece diagonally to an adjacent unoccupied square. If the square is occupied by an opponents’ piece, it may be captured (and removed from the game) by jumping over it to the unoccupied square one square beyond the opponents piece. The playable surface consists of using only the dark squares of a board with alternating light and dark squares. A piece may only move diagonally into an unoccupied square. Capturing is mandatory in most official rules, although some people play with variant rules which make capturing optional when presented.In all variants, the player who has no pieces remaining or cannot move due to being blocked loses the game, unless otherwise stated. Uncrowned pieces (men) move one step diagonally, and (may) capture opponents pieces by moving two consecutive steps in the same direction, jumping over the opponent’s piece on the first step. Multiple opposing pieces may be captured in a single turn provided this is done by successive jumps made by a single piece; these jumps do not need to be in the same direction but may zigzag changing diagonal direction. In English draughts men can only capture forwards, but in international draughts they may also capture (diagonally) backwards. When a man reaches the crownhead or kings row (the farthest row forward), it becomes a king, and is marked by placing an additional piece on top of the first man, and acquire additional powers including the ability to move backwards (and capture backwards, in variants in which they cannot already do so). As with non-king men, a king may make successive jumps in a single turn provided that each jump captures an opponent man or king. Normally, men can capture men, kings can capture men, but men cannot capture kings. In international draughts, with the flying kings rule kings can move as far as they want along unblocked diagonals. This move can (but needn’t) end by a capture in the usual way, jumping over an opposing piece to an adjacent unoccupied square. Since captured pieces remain on the board until the turn is complete, with flying kings it is possible for a king to reach a position where he is blocked from moving further by a piece he has just captured. Flying kings are not used in English draughts, in which a king’s only advantage over a man is the ability to move and capture backwards as well as forwards.